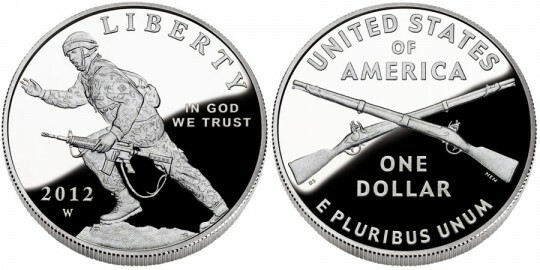 The 2012 Infantry Soldier Commemorative Silver Dollar Coin will be released by the United States Mint as one of two commemorative coin series to appear in 2012. According to the US Mint, the strikes honoring the infantry soldiers of the Army will be released on February 16, 2011 and be available in either proof or uncirculated condition. Congress authorized the Infantry Soldier Coins with the passage of the National Infantry Museum and Soldier Center Commemorative Coin Act (Public Law 110-357). According to the Act, the US Mint may strike up to 350,000 commemorative silver dollars "in commemoration of the legacy of the United State Army Infantry and the establishment of the National Infantry Museum and Soldier Center." Each silver dollar will be struck to the standard specifications for modern commemoratives. This includes a composition of 90% silver and a diameter of 1.5 inches. A $10 surcharge will be collected on the sale of each strike. Proceeds from that surcharge will be forwarded by the US Mint to the National Infantry Foundation for the purpose of establishing an endowment to support the maintenance of the National Infantry Museum and Soldier Center. Symbolizing the "Follow Me" motto of the infantry, a modern soldier is shown charging forward on rocky ground while beckoning fellow troops to proceed. The design was completed by Joel Iskowitz and sculpted by Michael Gaudioso. Obverse inscriptions include LIBERTY, IN GOD WE TRUST and 2012.